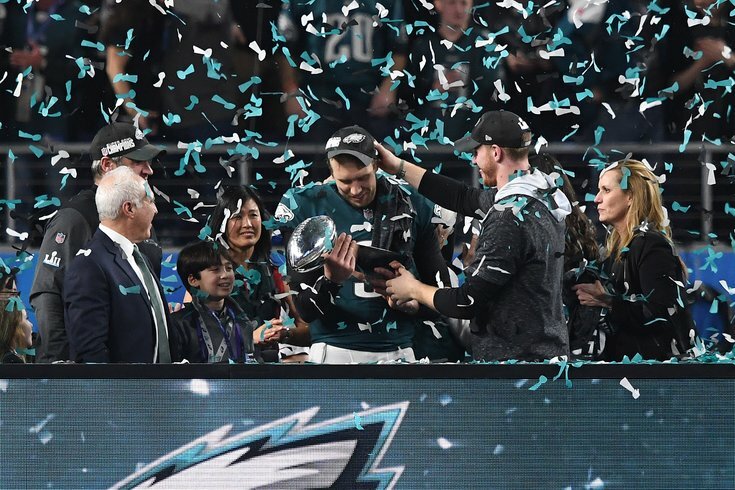 Philadelphia Eagles quarterback Carson Wentz (right) celebrates with Eagles quarterback Nick Foles after defeating the New England Patriots to win Super Bowl LII at U.S. Bank Stadium. The only thing sports-betting oddsmakers agree on is the Eagles have a pretty good chance of winning their second straight Super Bowl next February. Just how likely they are to win it, and how much a better can make on a bet, depends on who you ask. It varies — as lot. The consensus seems to be that the Patriots are the favorites to win Super Bowl LIII (in Atlanta), with the Eagles (and sometimes the Vikings or Rams) with the second best Lombardi Trophy odds. Some gambling sites, like SkyBook.ag, has the Eagles at +800 and the Patriots at +700. Others, like mybookie.ag, have them much further apart with New England at +400 and Philly at +850. For those unfamiliar, the odds are how much a gambler would win on a $100 bet made on a future outcome. And for Patriots fans, there's a big difference in the payout for being 7-1 or 4-1 favorites. Eagles fans can get 10-1 odds on a Super Bowl bet if they comb the web for sites like sportsbetting.ag or betonline.ag (+1000) — more bang for your buck. As many football or gambling enthusiasts know, action from betters can make the needle move, which means in some places it can be surmised that the Eagles have gotten more play than in others. The Eagles are betting favorites, ahead of the Patriots in Atlantic City.